In July, State Library Agencies (SLAs) were invited by YALSA to apply for the pilot cohort of the Transforming Teen Services: A Train the Trainer Approach (now known as T3) IMLS grant funded initiative. A joint project from YALSA and the Chief Officers of State Library Agencies, T3 continues the work of the 2018 National Forum on Transforming Teen Services Through Continuing Education by training SLA staff and public library staff to facilitate workshops on implementing coding and computational thinking programming through the lens of connected learning. Danielle Margarida, Youth Services Coordinator at the Rhode Island Office of Library and Information Services and Rebecca Ott, Young Adult Librarian at the Tiverton Public Library in Tiverton, Rhode Island threw their hat in the ring and were thrilled when Rhode Island was accepted as one of five states participating in the pilot. As a team, Danielle and Rebecca attended the first T3 meeting in Chicago during first weekend in October with an outstanding group of professionals from Alabama, Maine, Minnesota, and Wisconsin. The weekend consisted of activities that were both challenging and fruitful. 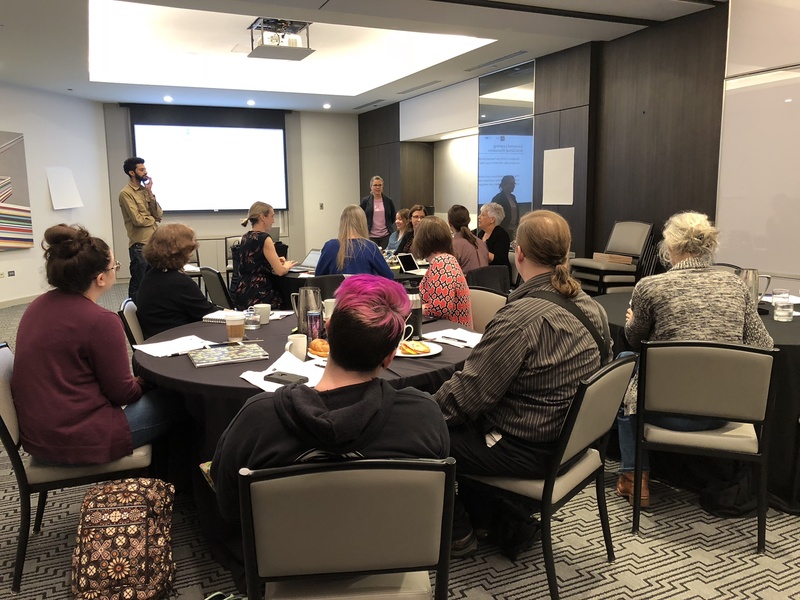 The cohort spent time working on issues of identity and equity, connected learning, facilitation skills, and ways in which ways in which we’ll help our colleagues statewide recognize and integrate connected learning into daily librarianship, programming, and services to teens. In this 16 minute Snack Break learn how Alyssa Newton is integrating coding activities into the work she does with and for teens in her community. After watching don’t forget to sign-up for YALSA’s October 20th webinar on coding, libraries, and learning. Members can register for free. Learn more on the YALSA website. By Jessica Snow April 10, 2016 April 10, 2016 Conferences and Symposia, YALSA Info. create extraordinary communities.” This was the theme for the bi-annual conference and it seemed to have genuinely expressed just that. I began the conference by leading a preconference titled “Emerging Adults in Our Libraries: Who are They and Where do we Find Them?” and while the theme doesn’t specifically pertain to teen services I think a lot of teen librarians (and this was part of the impetus for the research for the presentation) will attest to the reality that this is something they see and think a lot about with serving teens; what happens to them in terms of services and programs after they “age out” of teen services? This was a central focus of the research that myself and three other librarians embarked upon in 2015 by launching a nation wide survey into the work libraries are doing with and for emerging adults (ages 18-25/30). The presentation at PLA introduced our research findings, had participants do an activity based on real life scenarios we heard from librarians with our research, participants shared out possible solutions and then an expert panel spoke about the work they are doing with emerging adults and their families as well. Tomas Mejia, Director of Migrant Education at the Department of Education, Colorado, Clayton Gonzalez, Director of Programs, Urban Peak (a Denver, Colorado nonprofit that provides a full convergence of services for youth age 15 through 25 experiencing homelessness or at risk for becoming homeless) and Alberto Pellicer, Early Literacy Librarian, Denver Public Library. A blog has been created that includes information from the preconference, articles about this population, outreach to this population, and opportunities for other librarians to share the work they are doing with this population. The Bubbler @ Madison Public Libraries: A System-Wide Approach to Learning through Making was a great introduction into the work that Madison, Wisconsin Public Library is doing with and for peoples of all ages with technology programming, DIY programs, an artist in residence program and more. The Bubbler is a program and not a specific space, the programs take place in the Central Library, the 7 branches, schools, juvenile justice centers and in the community. There is a BIG focus on this kind of work with teens in schools, in the library and in the juvenile justice system and this is a library recognized effort. Making Justice is a community-based learning program for court-involved teens that includes weekly workshops and an artist-in-residence opportunity. They are doing all kinds of programming opportunities for teens involved in the juvenile justice system with music programming, bringing in hand drawn animation stations and more. The Bubbler is through an IMLS and NEA grants. Check out the Teen Bubbler site. I visited the Denver Public Library and had a chance to see the Idea Lab in action during time for teens in the space; Monday through Friday 3:00-6:00 pm. The SM Energy ideaLAB is a makerspace and digital media lab at the Central Library. With equipment and software, people can make videos, games, music, art, crafts, and more. The lab is free to anyone – no library card necessary! Not too many barriers for teens to use the space in terms of not having a library card, no problem. Sustainable Connected Learning for Youth focused on the initiative that the Cuyahoga County Library System has rolled out as a pilot in five locations with Connected Learning. The Information and Technology Department spearheaded this initiative by training staff in the focus areas of Connected Learning as well as provided ideas and worked with staff in identifying program ideas like STEAM programming, mentoring/social component and on the fly programming. The article in School Library Journal in March 2016 introduced some of us to the work Denver Public Library is doing with asset mapping and I joined the session, Teen Asset Mapping: A Community Development Approach to Teen Services Expansion to learn more about what they are doing. The Director of Denver Public Library and a staff consisting of librarians (one being the only Teen Librarian on the staff at DPL) and library associates worked tirelessly on this project beginning in 2013 with the idea that they weren’t providing teen services and wanted to but what would that look like in a city with a strong number of organizations that do provide teen services/programs. The idea was to identify what the assets for teens are in Denver; this would be outside library organizations and find out what exactly they are doing with and for teens. They developed questions and interviewed over 40 organizations and through the responses created a list of categories like juvenile justice system, teen parents, homeless youth, along with services/programs being provided. What came out of the research was a better understanding of what services/programs there were in Denver and what services/programs weren’t being offered and what needs there may be. The staff at DPL did an incredible amount of work on this and they are accessible; contact them through the link above as well as check out the resources they have available for more in depth information. By Christina Vortia December 7, 2015 January 3, 2018 Equity of Access, Futures Report, Learning Experiences, Technology, Teen Blogger, YALSA Info. A brief look at ‘grams of interest to engage teens and librarians navigating this social media platform. Last week marked the end of Nanowrimo. In case you haven’t heard of Nanowrimo it is a writing challenge with a name comprised of the condensed words: National November Writing Month. This annual call to write has swelled to include more than 53,000 writers from 6 of 7 continents. This challenge attracts big named published authors like Rainbow Rowell and Carrie Ryan. Fangirl by Rowell is a Nanowrimo book. The Forest of Hands and Teeth by Carrie Ryan…that’s a Nanowrimo book too. Nanowrimo churns out a fair number of YA literature every year and attracts more and more young adults as participants each year. Since 2005, Nanowrimo has been hosting YWP – Young Writer’s Program – for students in grades K – 12. When users turn 18, they are directed to the main site, where the word requirements jump from 30,000 for the month to 50,000. As we all know (and to the lament of Nanwrimo writers across the United States), with the end of November comes Thanksgiving and Black Friday. So in the midst of basting turkeys, Walmart brawls, football games and #ThanksgivingClapback dinner conversations, Nanowrimo writers continued to write – and guess what? Many of them actually finished, and then they did something even more awesome — they posted their experiences on Instagram! Nanowrimo writers posted quotes that inspired them, strategies for rising to the challenge, pictures of laptops, and furry writing buddies. There were lots and lots of pictures with coffee! Coffee with swirls, coffee in cute bookish mugs, coffee next to laptops, and then next to laptops and furry writing buddies… There were lots of pictures of food! My goodness, are Nanowrimo writers foodies or what!? Accordingly, preparing young adults for the workforce is a major concern in the United States. In the last three decades, the skills required for young adults to succeed in the workforce have changed drastically, but the skills emphasized in schools have not kept up with these changes.34 This has led to a widespread concern that young adults lack the necessary skills for job success and are entering the workforce unprepared. Several recent studies, including Workforce Preparation in the Context of Youth Development Organization35 and Literacy Skills and Self-Views of Ability among First Year College Students,36 have documented this skills gap. Now is the time for school and public libraries to reimagine themselves as 21st-century learning spaces. At the heart of connected learning is the idea that young people learn best when that learning is connected to their passions, desires, and interests. This focus correlates strongly with the learning ecosystem and learning needs of the teen of 2020 that Rainie described in his summit presentation. As noted in the CLRN report: The connected learning model posits that by focusing educational attention on the links between different spheres of learning—peer culture, interests and academic subjects—we can better support interest-driven and meaningful learning in ways that take advantage of the democratizing potential of digital networks and online resources. Having said that, enjoy this homage to the final week of Nanowrimo, and if your library participated in youth writer’s circles and posted on Instagram, maybe you’ll see yourself and hopefully you’ll be inspired to participate next year. Want to offer more hands-on learning opportunities for and with the teens in your community? 3D Systems Corp., in partnership with YALSA, is giving away up to 250 3D printers to members of YALSA. Learn more and apply online by Oct. 30th. Are you not a YALSA/ALA member yet? Membership starts at $60 per year. Contact Letitia Smith at lsmith at ala dot org, or 312.280.4390, to get the best rate and to learn about paying in installments. And don’t forget to check out all of the great maker and connected learning resources on YALSA’s wiki! By admin November 21, 2014 November 21, 2014 Advocacy, News, Reports, YALSA Info. 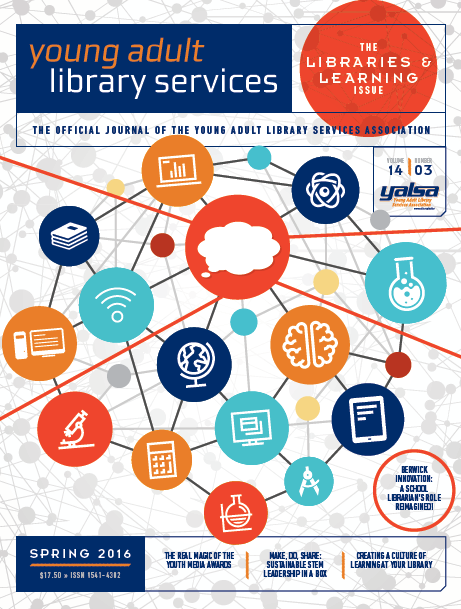 Back in January YALSA released its report, “The Future of Library Services for and with Teens: a Call to Action.” The report provides recommendations for ways libraries can evolve in order to better meet the needs of 21st century teens. YALSA would like to hear from the library community and beyond how this report has impacted you and your institution so far. What changes have you made in regards to serving teens or new things have you tried? What have been your successes and challenges up to now? What ideas did the report spark as you read it? Please take a moment to fill out a brief online form to tell us about what’s been going on with you and your institution since the report came out. Some of the information we gather will be featured in upcoming issues of YALS. Also, don’t forget that you can access free resources to help you and your organization learn more about some of the key issues in the report, like connected learning, cultural competence, and more via YALSA’s web site. We’ll be adding even more resources there over the next few weeks, so check back often. By admin October 7, 2014 October 7, 2014 Advocacy, News, Partnerships, Teen Services, YALSA Info. Those in the YALSA community would probably have no trouble agreeing with the statement that teen services in libraries could benefit from broader support from the library community and beyond.’ In an effort to help advance library services for and with teens, YALSA and its Future of Teens & Libraries Taskforce have submitted a grant proposal via a competitive challenge organized by the Knight Foundation.’ If funded, the project would help libraries improve their overall teen program by providing them with free tools and resources to incorporate connected learning into their existing services. ‘ In order for this to have a chance at getting funded, the proposal needs to get a significant number of â€˜applauds’ and comments from visitors to the site.’ We encourage you to ‘applaud’ the proposal and/or leave a comment, but also to take a moment to share this link out with your library networks, advocates and colleagues and ask them to leave a comment or give us some applause as well.’ The post is open to comments and applause until Oct. 21st, so timing is limited!’ Thank you for all that you do to help teens succeed in school and prepare for college and careers.’ The great work that you do makes a difference in so many lives, and together we can have an even bigger impact! Welcome to August and the first in a series of YALSAblog posts all about getting ready for the new school year. I don’t think there is a better way to get started thinking about going back to school then to check-in with YALSAblog readers about how you are implementing the ideas in the Future of Library Service for and with Teens: A Call to Action report published by YALSA in January of this year.